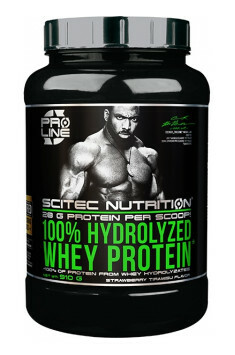 Scitec 100% Hydrolyzed Whey Protein is the highest-quality protein nutrient. It contains hydrolysed whey protein, ensuring fast absorption and muscle nourishment, which is why it is perfectly suited for consumption e.g. just after training. One dose contains 28 g of protein. Moreover, the product contains an enzyme, lactase, which is why it is perfect even for people with lactose intolerance. Hydrolysed whey protein ‒ whey protein is broken down into smaller molecules thanks to the activity of hydrolytic enzymes. In this way, a predigested form is obtained, in which proteins are partially hydrolysed, which facilitates their absorption. The hydrolysate does not require long digestion, which makes it more available for the body system and will be perfect e.g. after training. Protein supplementation combined with resistance training may be a key factor supporting the synthesis of muscle proteins and the lean body mass building. A study published in International Journal of Sport Nutrition and Exercise Metabolism demonstrated that using whey protein by people doing strength exercises brings more benefits than training without supplementation. It turned out that men consuming protein observed a relatively greater muscle mass growth. Protein contributes to the growth of strength and weight. It provides the proper amount of proteins that are building material of muscle tissue. This leads to an increased release of anabolic hormones, such as insulin. Apart from that, whey protein is rich in an amino acid most important for muscle mass building, leucine. Leucine stimulates muscle protein synthesis at the molecular and genetic levels. The study from The Journal of Science in Medicine and Sports demonstrated that people consuming whey protein hydrolysate after training observed better regeneration and progress in the short time after intensive resistance training, when compared to people using non-hydrolysated whey protein. The group consuming protein in the form of a hydrolysate got back in shape after 6 hours, when compared to the group using isolate whose regeneration took longer than 24 hours after training. The hydrolysate is a perfect choice for people doing regular, intensive workouts. It allows for faster regeneration of muscle microdamages and restoration of glycogen reserves. It is also perfect to improve endurance and efficiency of intensive workouts. To sum it all up, Scitec 100% Hydrolyzed Whey Protein is a high-quality protein nutrient, worth the attention of anyone who wants to build muscle mass. It provides the proper amount of proteins, which are essential especially in case of high activity and regular physical effort. It also facilitates body system recomposition and loss of excessive adipose tissue. Thanks to the hydrolysate form, this protein is well available and allows for faster muscle regeneration. Dissolve one portion of the product (35g = 1 measurement scoop) in 350 ml of water. Depending on the individual needs, use one to three portions a day, especially during breaks between meals and after training. Due to the extremely fast bioavailability, hydrolysed whey protein is perfect as an addition to the post-workout shake or as the first meal of the day. Keep in mind that if your diet does not provide the proper amount of protein, the supplementation itself will not have a significant influence on your results. Supplements of Scitec Nutrition are designed for people practicing power sports. The offer includes products like high-quality creatine, glutamine, protein supplements, fat burners, weight gainers and BCAA. There are also protein bars and sports drinks in various flavors. These products helps to increase the energy and allow you to achieve better results during training. Clinical studies of 7-Keto® DHEA demonstrated increases in metabolic rate and improvement in body mass index. Support for the fat tissue burning process. CLA combined with green tea, guarana and chromium.